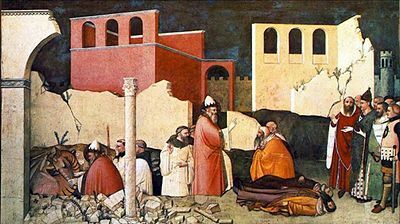 Pope Saint Sylvester I, also called Silvester, was pope from January 31, 314 to December 13, 335, succeeding Pope Miltiades. The son of a Roman named Rufinus, he served as the bishop of Rome at a crucial era in the history of Christianity, during the reign of Constantine I and the emergence of the Arian controversy, that involved matters pertaining to Christology and the Trinity. During Sylvester's pontificate, Christianity became the favored religion of the Roman emperor, after having endured centuries of intermittent persecution. Sylvester did not himself attend the First Council of Nicaea in 325, but he was represented by two legates. During his administration, Constantine founded several great churches in Rome and the Roman church grew to a position of increasing influence. Silvester also figures in the important document known as the "Donation of Constantine," fabricated in the second half of the eighth century and purporting to record Constantine's giving Silvester (and his successor popes) imperial authority as both spiritual and secular rulers in the Western Roman Empire. The document is now universally admitted to be a forgery designed to bolster the claims of the papacy. This and other legends portrayed Constantine and Silvester in close relationship and even made the pope the deliverer of Rome from a mighty dragon. In the West, the liturgical feast of Saint Sylvester is celebrated on December 31, the day of his burial in the Catacomb of Priscilla. According to the Liber Pontificalis Sylvester I was the son of a Roman named Rufinus, and another source, the highly legendary Vita beati Sylvestri calls his mother Justa. He came to the Roman episcopacy after the death of Pope Miltiades (Melchiades), who led the city's church during the period of Emperor Constantine I's accession to the imperial dignity, resulting in a sudden change in the church's former position as a persecuted sect. Statue of Silvester I in Montova, Italy. Sylvester held the position of bishop of Rome for 21 years, making him one of the longer-reigning popes. During this time, the public position of the church greatly improved, a change which must certainly have been very noticeable at Rome. Unfortunately, there is little authoritative information concerning Sylvester's pontificate. At an early date, legend brings him into an intimate relationship with the first Christian emperor, Constantine, but most of these stories are contrary to historical fact. Especially important to his legend was the Vita beati Sylvestri, which appeared in the East and has been preserved in Greek, Syriac, and Latin in an equally apocryphal account of a supposed Roman council, produced between 501 and 508. The forged Donatio Constantini Donation of Constantine made Sylvester a pivotal figure in medieval Christianity, as it portrayed him as the recipient of imperial lands and authority, along with his successors in the papacy. 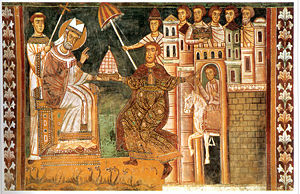 The accounts given in all such writings—concerning the supposed persecution of Sylvester, his healing and baptism of Constantine, the emperor's gift to the pope, the imperial rights granted to the papacy, and the council of 275 bishops at Rome, not to mention Sylvester's rescuing Rome from a dragon—are recognized today to be entirely legendary by Catholic, Protestant, and secular scholars alike. The pope, however, did take part in the important negotiations concerning Arianism, which resulted in Constantine's calling the Council of Nicea, to which Sylvester sent delegates. The debate had badly divided the churches throughout many parts of the empire. It centered on the question of Christ's relationship to God the Father, specifically whether the Logos—the preexisting Son of God—was begotten by God at a definite point in time or whether he existed with God from the beginning. In condemning the views of Arius, the council adopted the idea that Christ and the Father were not merely of "like substance" but of precisely the "same substance," with Christ having been "eternally begotten of the Father" and "not made." The key expression homooúsion (same substance or "consubtantial") was championed by Bishop Athanasius of Alexandria and approved by Emperor Constantine himself. It is thought by some to have been agreed upon with the pope before the council. Sylvester sent two legates to this first ecumenical council, but it is doubtful that Constantine had consulted beforehand with the pope concerning the convening of the synod. Earlier, Constantine had initiated a western council under the presidency of Pope Miltiades to deal with the Donatist controversy in Africa. At Nicea, papal delegates signed the council's decrees, but it was not thought necessary to gain the pope's approval beyond this. Also during Sylvester's pontificate, Constantine built several great churches in Rome, namely the basilica and baptistery of the Lateran near the former imperial palace which the emperor had given the previous pope as his residence, the basilica of the Sessorian palace (renamed Santa Croce), Saint Peter's famous church in the Vatican, and several cemetery-churches over the graves of martyrs in the Roman catacombs. It is nearly certain that the pope assisted in the construction and consecration of these churches, but his role is not specifically indicated. Sylvester's memory is especially connected with the titular Church of Equitius, situated near the baths of Diocletian, which takes its name from a Roman presbyter who is said to have built this church on his property. No doubt the pope contributed to the development of the liturgy of the Roman church during this period of unprecedented imperial favor. However, the list given by the Liber Pontificalis of regulations passed by him cannot be considered historically reliable. During his reign, the first martyrology of Roman saints who suffered under previous persecutions may have been drawn up. Sylvester is also connected with the establishment of the Roman school of liturgical singing. On the Via Salaria, he built a cemetery-church over the Catacomb of Priscilla, the ruins of which were discovered in the nineteenth century. In was here that he was buried. His feast is given under the date December 31 in the Depositio episcoporum, a list of the burial days of the Roman bishops which was compiled barely a year after his death. This day, therefore, is doubtless the day of his actual burial. There was at Rome a dragon in a pit, which every day slew with his breath more than 300 men… Silvester put himself to prayer, and Saint Peter appeared to him… And when he came to the pit, he descended down 150 steps, bearing with him two lanterns, and found the dragon, and said the words that Peter had said to him, and bound his mouth with the thread, and sealed it, and after returned. And as he came upward again he met with two enchanters which followed him for to see if he descended, which were almost dead of the stench of the dragon, whom he brought with him whole and sound, which anon were baptized, with a great multitude of people with them. Sylvester's most noted legacy was the eighth-century forgery purportedly issued by Constantine I, granting Sylvester I and his successor popes, as followers of Saint Peter, both spiritual and secular power over the Western Roman Empire. The text claims that the donation was Constantine's gift to Sylvester for instructing him in the Christian faith, baptizing him, and miraculously curing him of leprosy. It gives the popes specific dominion over lands in Judea, Greece, Asia, Thrace, Africa, Italy, and the city of Rome. The pope was ceded the entire Western Roman Empire, while Constantine would retain imperial authority in the East from his new imperial capital of Constantinople. Today, this remarkable document is thought to have been created in an effort to bolster the position of Pope Stephen II in his negotiations with Pepin the Short. In 754, Stephen II crossed the Alps to anoint Pepin king, thereby enabling the Carolingian family to supplant the old Merovingian royal line. In return for Stephen's support, Pepin gave the pope the lands in Italy which he had wrested from the Lombards. These lands would become the Papal States and would become the basis of the papacy's secular power for the next eleven centuries. According to the contemporary church historian Eusebius of Caesaria, the actual baptism of Constantine, who delayed the act until he was near death in order to avoid committing post-baptismal sins, was performed by Bishop Eusebius of Nicomedia. In 762, Pope Paul I transferred Silvester's relics to the Church of San Silvestro in Capite, which became the official church of the English Catholics in Rome. The church is noted for the supposed fragment of the head of John the Baptist kept there as a relic. A second Roman church dedicated to Saint Sylvester is San Silvestro al Quirinale. His feast day, falling as it does on New Year's Eve is known as Silvester in German-speaking and other European lands. Hinchliff, Peter Bingham. Cyprian of Carthage and the Unity of the Christian Church. London: G. Chapman, 1974. ISBN 9780225660357. Maxwell-Stuart, P. G. and Toby A. Wilkinson. Chronicle of the Popes: The Reign-by-Reign Record of the Papacy from St. Peter to the Present. W W Norton & Co Inc, 1997. ISBN 9780500017982. All links retrieved May 22, 2015. History of "Pope Sylvester I"
This page was last modified on 22 May 2015, at 20:48.